The marbled godwit (Limosa fedoa) is a large shorebird. 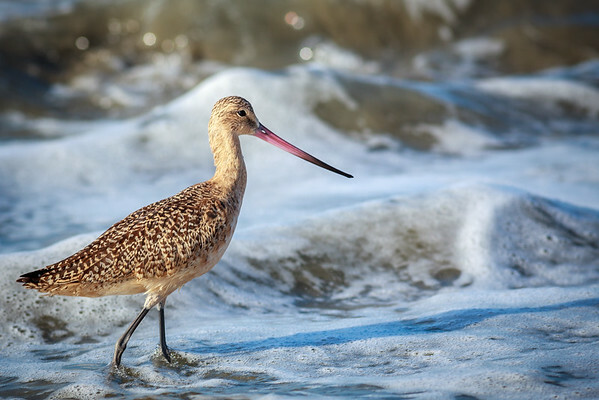 On average, it is the largest of the 4 species of godwit. The total length is 40–50 cm (16–20 in), including a large bill of 8–13 cm (3.1–5.1 in), and wingspan is 70–88 cm (28–35 in). Body mass can vary from 240 to 510 g (8.5 to 18.0 oz). Adults have long blue-grey hairy legs and a very long pink bill with a slight upward curve and dark at the tip. The long neck, breast and belly are pale brown with dark bars on the breast and flanks. The back is mottled and dark. They show cinnamon wing linings in flight. Their breeding habitat is the northern prairies of western Canada-(Canadian Prairies), and the north central Great Plains, United States near marshes or ponds. They nest on the ground, usually in short grass. In autumn, they migrate in flocks to the coasts of California, the Gulf of Mexico, Mexico and South America. These birds forage by probing on mudflats, in marshes, or at the beach (see picture below). In short grass, they may pick up insects by sight. They mainly eat insects and crustaceans, but also eat parts of aquatic plants. Their numbers were reduced by hunting at the end of the 19th century. Although they had recovered somewhat since that time, their population has declined in recent times as suitable habitat is used for farming.